A couple downsides to having a glass aquarium is the potential for springing a leak and glass breakage to occur. You can figure out for yourself how breaks happen. For leaks, most are usually caused by a flaw or failure in the sealant, either generated during construction of the tank or over time becomes weak and begins peeling away from the glass. This can lead to leaks of a small annoying pin hole size, up to and including a major seam blowout, like ones that result in an empty tank, a soaked carpet, and water leaking through the floor down into the basement. Most often pin hole sized leaks can be fixed from the outside, without having to totally drain or tear the whole tank apart, but for major leaks or glass breakage, this requires some reconstruction of the tank. The good news? Repairing a leak is actually not a difficult task, whether it be a major or a minor one. When we began building glass aquariums for our fish collection business in 1989, we were treated to our fair share of leaks. However, learning from our mistakes lead to great success in building, as well as repairing our aquariums over the years. Even today the 55 gallon aquarium in our living room is one of the originals we built, and many of the others we gave away are still in use as well. 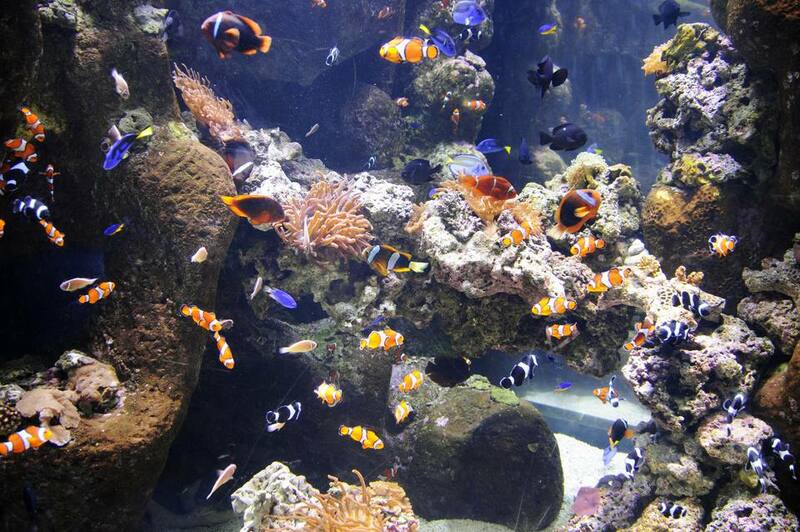 Don't use the wrong kind of silicone sealant; use only a non-toxic 100% silicone sealant appropriate for aquarium use. Not cleaning and preparing the glass surface properly or adequately enough. Not repairing a large enough area up, down, or around where the actual leak generates from. Not using enough silicone sealant. Not allowing the silicone to dry long enough. Not aligning or placing the glass pane edges flat and evenly together. Don't make major repairs under humid conditions. Duct tape will not stick to the glass when it is humid, therefore, the glass may move before the silicone can set up. Humidity slows the silicone curing process as well. Not having the aquarium sitting on a flat surface doesn't cause bad repairs, but one time we had an aquarium crack all the way across the bottom pane of glass, which wasn't broken when we started out. How do you think we figured out how to make a complete break repair? So what will you need to repair a leak, as well as build a tank from scratch? Here is a list of items that you will need for repairing minor or major leaks in glass aquariums, as well as for building a tank from scratch. A non-Toxic 100% silicone sealant. We have used NAPA (part #765-1336) with good results for years, or use All-Glass® Brand 100% Silicone Sealant or a similar type aquarium sealant. A washable felt tip marker. For repairing major leaks or building a DIY aquarium, a roll of duct tape. For building a DIY aquarium, some emery cloth or silicone carbide sandpaper.